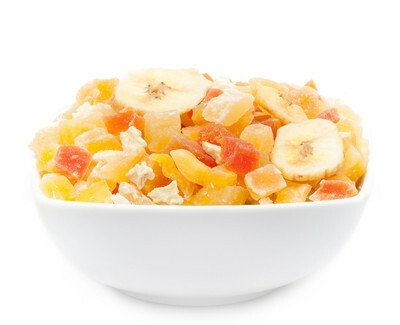 Fruity snack mix with dried and candied pieces of fruit of papaya, mango, melon, pineapple, coconut, apple and candied bananas. Sugar cane, papaya, mango, melon, pineapple, apple, banana, coconut, vegetable oil, sugar, honey, sulfur dioxide, citric acid, melon aroma. May contain traces of SULPHITES and NUTS. What a kingly feeling it is to be pampered and have every wish read from one's lips! Enjoy our SPA FRUITY MIX and you will encounter that feeling: noble, candied fruit in beautiful colours such as papaya, mango, melon, pineapple and apple, sweet slices of banana and on top of all that, delicious stripes of coconut. Believe us, you will enjoy being a king or a queen! You don't have to leave your home and pay a lot of money in order to enjoy the advantages of a spa. Just grab a bag of our incredibly yummy SPA FRUIT MIX and you will start relaxing right away! Selected dried fruits will let you forget about your stressful day at work and send you to a world of fruity pleasure! When you are having one of those days that simply drain all your energy, you should really take some time for yourself. Kick off those shoes, make yourself comfortable, maybe let in a nice warm bath - and then, get that bag of SPA FRUIT MIX out of the paintry! Now you got yourself some personal spa time: let your taste buds take you on a journey to the many countries where the fruit of our mix originate. Your spa day has never been closer to home!